Pittwater Council is delighted to report the sighting of five Barking Owls (Ninox connivens connivens) around the Bayview – Church Point area in recent months. The group comprises parents and three (now sub-adult) young (pictured above). This is significant for our local government area as these animals, prior to 2013, have not been reported for almost two decades and since 2013 this is the first sighting that has confirmed successful breeding. The Barking Owl is a medium-sized hawk-owl. Hawk-owls lack the definite heart-shaped face of the Tyto-owls (e.g. the Barn Owl, Tyto alba) pictured below. Adult Barking Owls are grey-brown above, with white spots on the wings and whitish below with vertical grey-brown streaks on chest. The head is almost entirely grey-brown, and the eyes are large and yellow. Young Barking Owls have less streaking on the underparts and are mottled white and grey-brown on the rear of the neck. 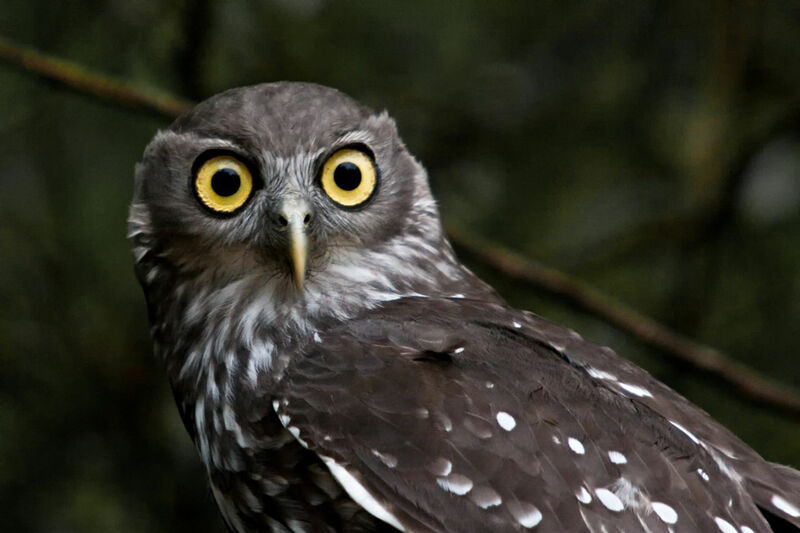 Barking Owls are between 35 and 45cm in length. The similarly plumaged Southern Boobook (Ninox novaeseelandiae) is more brown and has more spots (rather than streaks) on the underparts. The Southern Boobook is also smaller, measuring 28 to 36cm. The Powerful Owl (Ninox strenua) is a similar brown to the Barking Owl but easily distinguished by horizontally barred chest stripe. The Powerful Owl is also the largest measuring 45 to 65cm. Southern Boobook Owl small, rufous coloured and spotted not barred or streaked. Barking Owls are present throughout Australia except central areas. They are found in open woodlands and the edges of forests, often adjacent to farmland. They are less likely to use the interior of forested habitat. They are usually found in habitats that are dominated by eucalyptus species particularly red gum and in the tropics, paperbark species. They prefer a high density of large trees and particularly sites with hollows that are used by the owls as well as their prey. Roost sites are often located near waterways or wetlands. They are nocturnal (night) birds although they may sometimes be seen hunting during the day. They feed on a variety of small to medium-sized mammals, birds, reptiles and insects. The Southern Boobook feeds on insects, reptiles and small mammals whilst the Powerful Owl feeds almost solely on mammals and occasionally birds. All of these owls rely on the availability of large hollows for breeding. The nest site is an open hollow in a tree trunk. The entrance hole is usually 15 to 25m or more above the ground, though the nest chamber may be up to 10m down inside the tree. The female incubates the eggs, while the male supplies the food. Young owls remain dependent on their parents for several months and will remain in the family group until a few months before the next breeding season. The Barking and Powerful Owls are both listed under the NSW Threatened Species Act 1995. Habitat loss and degradation is a major threat to the survival of all owl species. Hollow-bearing trees loss and firewood harvesting impacts on the species by removal of nesting and roosting sites. These also remove habitat for hollow-dependent prey such as gliders, possums and parrots. Competition from feral honeybees for roost sites has been named a key threatening process for this species in NSW. Competition with foxes and feral cats, as well as predation by foxes is also thought to be a reason for their decline. In rural areas Barking Owl mortality has also been recorded due to secondary agricultural poisoning, barbed wire fences and vehicle collisions. - Environmental projects and grants. 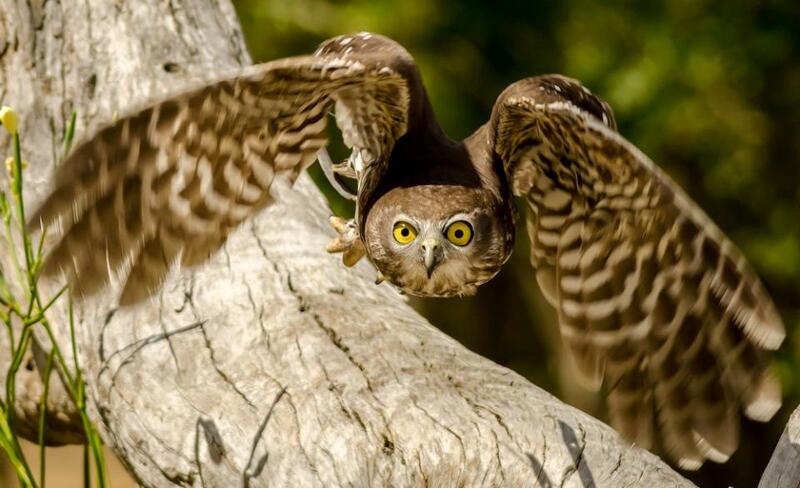 Powerful owl Ninox strenua - picture by Paul Wheeler, 2014.